Today’s messy situation is from Kat! 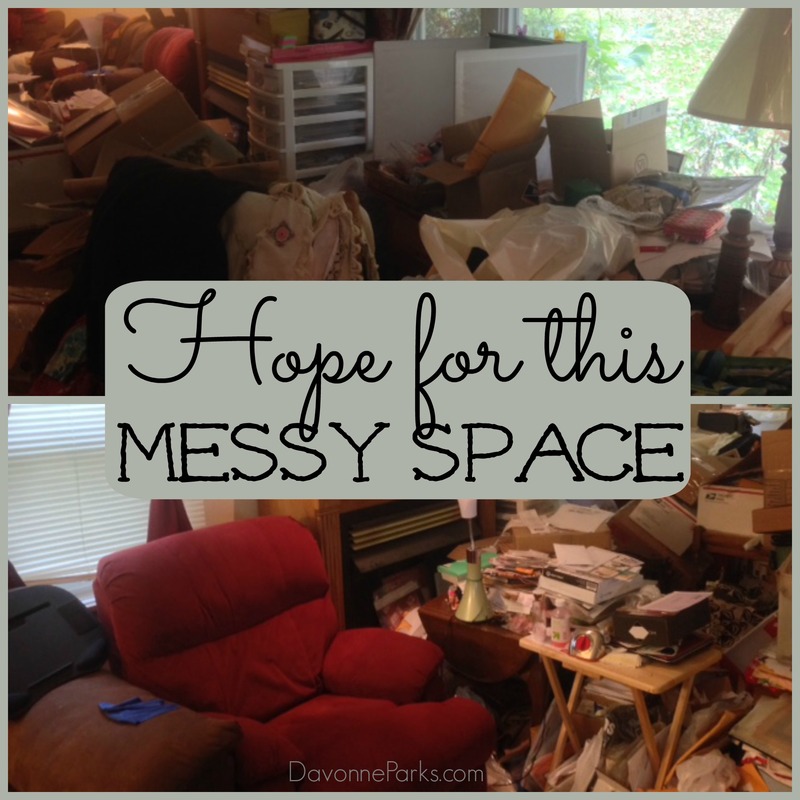 “Hi Davonne, I have been loving your Get Organized blog posts and I would love your help if you can squeeze me in! I recently had my last day of full time work. I’m a single mom of a 13 year old boy. I had to pull him out of public school due to bullying and he’s attending an online school right now. I’m thinking about making the jump to homeschooling as well as trying to work from home rather than go back to the Corporate life. Additionally, we’re moving from Ohio to California in December so that we’ll be close to family and friends. I’m spending the next 2 months sorting, tossing and packing while continuing to sell needlecraft items on eBay and Etsy. The pictures show the sorry state of my stock/photo/shipping area. It’s mostly boxes and stacks and has overflowed the dining room area where Gabriel does his schoolwork and our living room! Wow, Kat, those are a lot of changes all at once! My first piece of advice is to give yourself grace. You’re not going to do this perfectly and that’s okay! In regards to your work situation, you may like this post about how to make money working from home. However, I do know that being organized helps a move go more smoothly so I definitely recommend reading Chaos to Clutter-Free as you go through your home and purge, purge, purge. I also looked around online for you and found this incredible article from A Bowl Full of Lemons about how to have an organized move. Office Mess SOS: You’re probably going to need to break your cleaning into a few sessions, so read that article for help on knowing what tasks to tackle on which days. Simplifying Paper Clutter: You can apply these tips to your boxes and other supplies as well as any paper clutter that’s laying around. Help for the Desk Mess: I know you’re moving. But it wouldn’t hurt to think ahead to office storage solutions! I hope this helps you, Kat! Please let me know if you have more questions once you start working on your space and don’t forget to send after photos! PS Don’t forget that if you submit your own mess by October 30th, you’ll receive a free copy of Chaos to Clutter-Free, plus you’ll be entered into a drawing to win a $50 Amazon Gift Card! Details and submission information are here.